People are talking about global warming and trying to make changes to their lifestyle right now. David Attenborough's Our Planet series on Sky Atlantic and this week his BBC1 programme Climate Change: The Facts have powerfully spelled out the consequences on people and animals if we carry on doing nothing. It's depressing to see great piles of plastic carrier bags still in our supermarkets. Time they changed to paper bags. But actually that comes under the heading of Pollution, not Global Warming. What we, as individuals can do to help is to stop buying anything that is air freighted like exotic fruit and veg; eat less meat and less dairy - ideally switch to a plant-based diet; buy second hand, not new; avoid flying and save energy where possible ie cycle don't drive. There are dozens of other ideas for a greener lifestyle but maybe that's for a different blog! One of my highlights this week was a visit from embroiderer Ann Hutchings who made the brooch above. We sat at the table making in the shop and it is so nice to have company. She showed me how to make quick roses from tissue paper. She once covered a whole marquee in roses like this and they literally take less than 5 minutes each to make. Great for a future shop window display. Maybe in June when roses are in bloom in the garden. Last night I was lucky enough to see Michele Carragher, principal embroiderer of the Game of Thrones costumes give a talk. Michele has done many films and TV programmes and her ability with needle and thread was truly mind-blowing! She told us that after attending The London College of Fashion she worked as a textile conservationist, repairing and re-making ancient, threadbare cloth. This experience proved a good grounding for her current work on Games of Thrones and, before that on the Helen Mirren version of Elizabeth I. After 20 years of creating intricate embellishments for beautiful costumes Michele Carragher is surely the Queen of Embroidery! The paper they're painted on looks interesting too! I also enjoyed crocheting this rabbit container for the spring window. 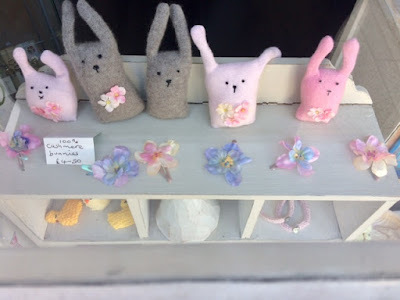 There are now two painted flower garlands decorating the shop window and the white bunny is hooked high up for children to spot. I love sharing what I do and what is in my little shop, Handmade Happiness in Petersfield, England. But I am wondering whether or not to continue with this blog. After all I have been writing it for over 10 years now. Maybe that is some kind of record??? It would encourage me to continue writing if occasionally one of the many hundreds of people reading this would supply a comment...I don't know who you are because this is a blog that doesn't get comments and I don't know why. I can see from the Statistics that two thirds of my readers live in the United States and one third live in the UK. And sometimes there is a huge influx of readers from Russia or China depending, I suppose, on what is being written about. Posts about London with lots of photographs get a big response which is good because I'm going there again next week and will make sure to take nice photos!! Maybe it's too difficult to supply a comment and you've tried but given up. But please say hello and introduce yourself. I would love to meet you!! If you like Vintage style, Midhurst has become the place to go to see lots of it. Faded pinks, off whites and chipped paint furniture is a look that is very popular.Rachel Ashwell, an Englishwoman in America started the look over 20 years ago and I love her pretty books promoting all that is 'Shabby Chic' which she took as her brand name. In West Street, Midhurst, Lucy Haywood who runs the Country Brocante Fairs has got two shops which are a joy to look round. The new shop called the Country Brocante Meeting House has a Cabbages and Roses shop within it. I fell for a long white velvet coat with dark pink roses on it. I guessed it would be around £300 and I was right. But this was the sale price. It was reduced from £600! I could imagine a Winter bride wearing it at a registry office wedding. Do you remember when Jigsaw had an area of Cabbages and Roses clothes? Always nice to look at. In the original Country Brocante shop you can find zipped bags, cushions and lampshades made from Cabbages and Roses fabrics. I particularly like the exquisite packaging created by Emma Gurmin whose company Velvet Ribbon sells through the shop. 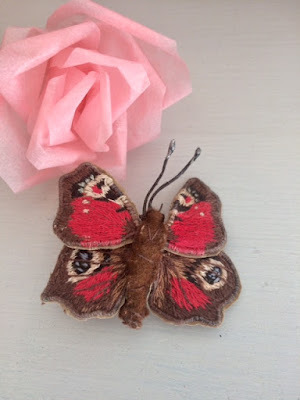 She has packaged vintage fabrics in handmade envelopes from vellum and rag paper and the result is frameable! If you want to get inspired by this look, get your hands on a copy of Lucy Haywood's new book Country Brocante Style. Also worth going in is Stuff in West Street. I love this shop. Such a good place to find an unusual present. The merchandising and selection of gifts you don't see elsewhere is a treat. And for me, 'Champagne tastes, beer money!' the Macmillan charity shop in the High Street, Midhurst is the best charity shop I know! 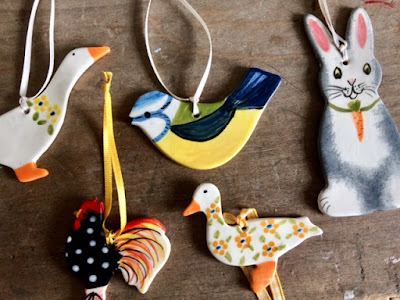 Kate Hackett makes these ceramic decorations. Knitted chicks to hold a Lindt egg. Just £1 each. My cashmere bunnies. These ones with pockets for a little chocolate egg. £4.50 each. 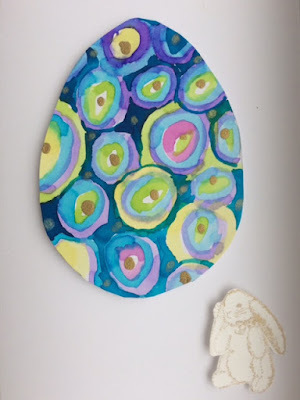 Painted Easter cards, blank inside by Jenny Stacy. £3.50 each. Thinking of Easter and family get-togethers...you don't always want to give children just chocolate, especially knowing they'll have plenty of chocolate from other people. Handmade Happiness offers lots of non-chocolate choices or some items to tie onto an egg or put a little chocolate egg into. I am hoping that lots of people will come in to Handmade Happiness in the run up to Easter because frankly if the shop is going to survive the Brexit retail downturn things will have to improve a lot! There I've said it. I had to make a name badge for Monday. It's a bit big but it will do. 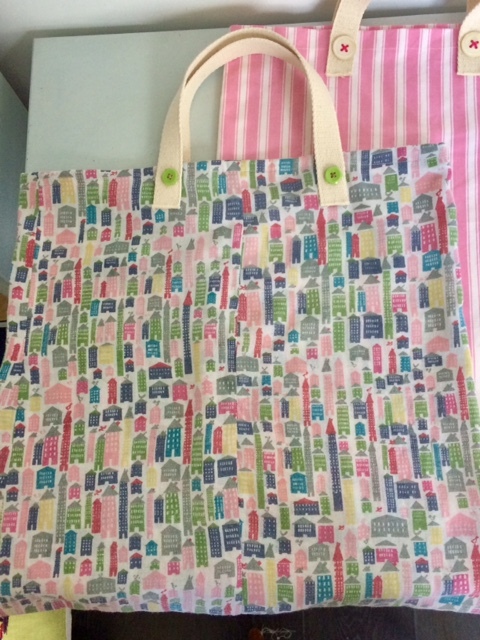 I recently re-joined what was the Embroiderer's Guild but is now known as Phoenix Stitchers in Petersfield. There is a speaker and workshop once a month. All members have to make a badge to identify themselves. 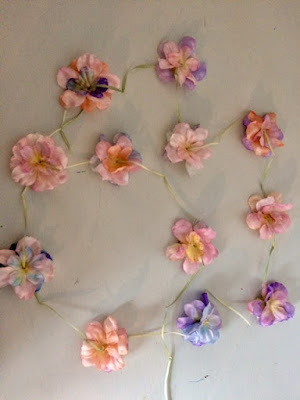 I painted flower petals in the shop thinking of using them in brooches or hair clips, perhaps layered together. It's blossom time here and the trees are heavy with it. 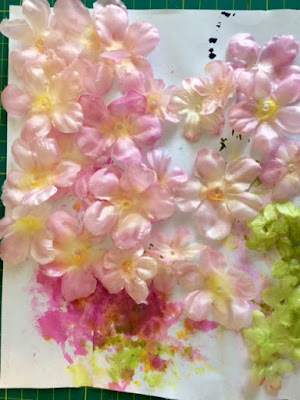 The right time to be thinking of using some fake blossoms in our making projects. 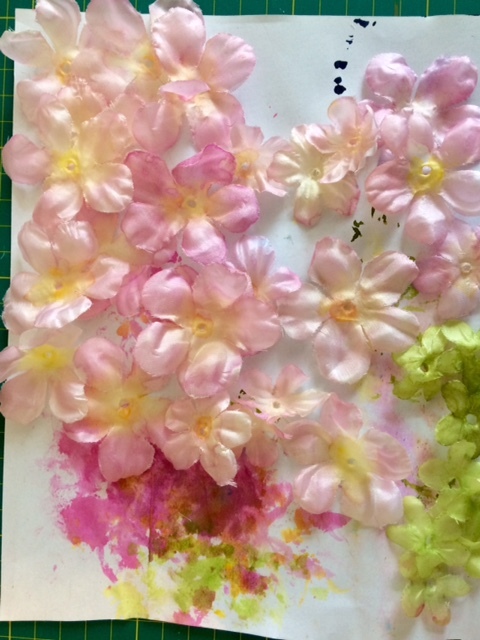 If I paint more petals I want to be more adventurous with colour and use some rich purples and reds. Still to resemble nature... because what I hate to see is real flowers for sale that have been made to drink dye in shades of blue or bright pink. That just feels wrong. The shop is so lucky to stock Niloo Wickramasinghe's pottery and throws. The throw, using Kate Forman fabrics, is entirely sewn by hand which makes it very special indeed. 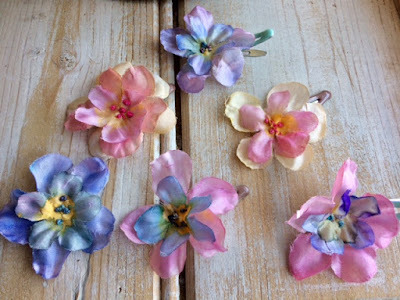 Annie Sherburne's colourful jewellery is something else very special stocked by Handmade Happines. I love wearing this little brooch. The colours are so eye-catching. If you haven't visited for a while, you'll notice the shop has new stock from several different people. It is currently undergoing a spring clean but still very much open to visitors. This time last year I was writing another blog called 'Seeing India with Jenny'. I was writing it after coming home so read it from the first post onward. The first post was written on Saturday March 3rd and called 'Have Yellow Hat Can Travel'. I've just looked at it again and the pictures are surprisingly good! It's a shame it reads from last day to first but by clicking on newer posts at the bottom of each page it can be read chronologically. The weak post is about Gandhi which I remember copying from Wikipedia. Note to self - keep it personal! !